Inductees / Lorne Tudhope Insurance Brokers Ltd.
Lorne Tudhope was born in Parry Sound, Ontario, on July 1, 1925. Lorne went on to join the armed forces in January of 1944, where he became a member of the first parachute battalion during WWII, jumping from planes onto enemy grounds, a daring and brave task. While hitchhiking back to his base in Niagara Falls after a leave of absence, Lorne was picked up by his future wife, 16 year old Marjory and her Mother. They were married on September 23, 1948 in Parry Sound. After the war Lorne joined his brother Gord at Tudhope Cartage Ltd.
After working with Tudhope Cartage for some time, Lorne, being very interested in self employment and not keen on pursuing a career in welding, a skill he had studied in school, began searching for business opportunities in the Parry Sound area. He eventually came across H.J. Watson Insurance Agencies Ltd. and along with wife Marjory, as his original partner, Lorne purchased and dove into the insurance business. Lorne and Marjory changed the company’s name to Lorne Tudhope Insurance Agencies Ltd. This smart business investment eventually expanded with the purchase of several other insurance companies and the addition of four business partners: Ken Dobson, recruited while working as a sales rep for Dale & Company in Toronto; Ken Brown, owner of Ken Brown Insurance; Bob Drummond, former Branch Manager of the Parry Sound CIBC; and Brock Tudhope, son of Lorne and former Forest Technician with the Ministry of Natural Resources. In 1981 the firm officially changed its name to Lorne Tudhope Insurance Brokers Ltd. in order to reflect the incoming self regulation by the Registered Insurance Brokers of Ontario. 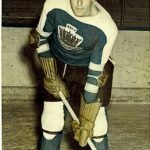 It was evident early in the company’s history that all its partners had an interest in sports – mainly golf, curling and hockey. 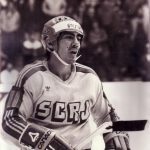 As all three of these sports were extremely popular in the Parry Sound Area, Lorne Tudhope Insurance saw them as a way to get involved in the community. Together Lorne, Ken Dobson, Ken Brown, Bob and Brock have supported local sports teams, events and facilities for over 43 consecutive years. The partners have served as model corporate citizens. In addition to providing very significant monetary contributions to sports and recreation programs, special events and charitable causes, they have all volunteered their time, skills and expertise with a number of sports groups and charitable organizations, often with an emphasis on serving children. One of Lorne Tudhope Insurance’s most notable contributions has been to the Parry Sound Golf and Country Club. The partners have acted as members and treasurers of the club, Lorne Tudhope and Bob Drummond both served as Presidents and Lorne and Marjory have become Honorary Members. Throughout the last 22 years Lorne Tudhope Insurance has provided the Golf Club with monetary support to purchase maintenance and leisure equipment, paid for score cards, sponsored tournaments and purchased road signs. In fact, the Golf Club would not be in the location it is today had it not been for Lorne Tudhope Insurance and more notably Lorne, Ken Brown and Ken Dobson, owners of an outside business venture called Soundland Development Corporation. Originally the Golf Club was to be located on Pine Ridge Road. With the beginning of the construction of the new highway, a lack of water and resistance from local residents, the Golf Club began searching for a new, more fitting, property. At the time, Soundland Development Corporation had purchased a piece of vacant land which they planned to develop. After hearing about the Golf Club’s issues Soundland Development Corporation began working on a land transfer that would give the Golf Club their property on George Hunt Memorial Drive in exchange for the Pine Ridge Road Property. In 1985 after much time and paperwork, the land transfer became official. The Parry Sound Golf and Country Club still exists on this property today. Lorne Tudhope Insurance’s love for golf continued and in 1967 the partners developed the Lorne Tudhope Invitational Golf Tournament which was designed to bring people into the community. Lorne Tudhope Insurance and more notably, Ken Dobson have also been involved with the “Snake Bite Classic” which is played annually by members of the Parry Sound Muskoka Insurance Brokers Association. 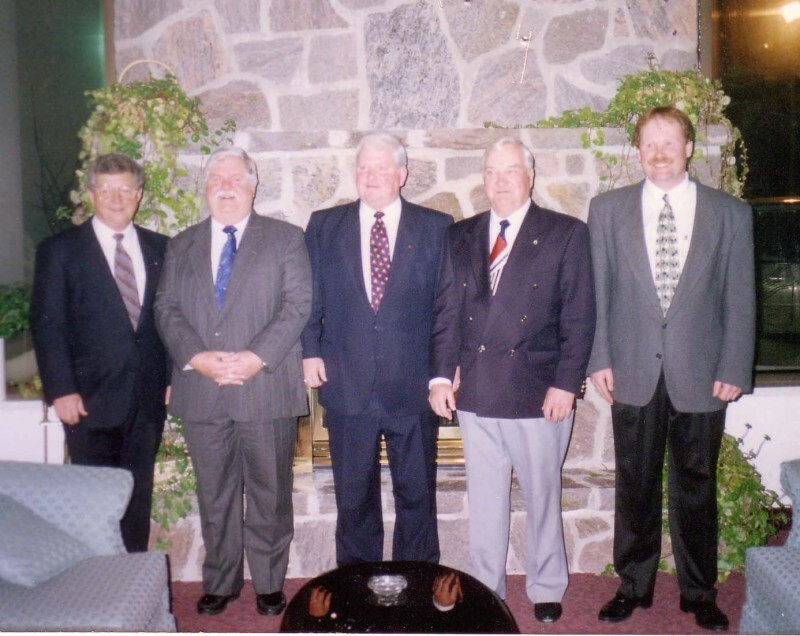 Ken acted as the first President of this association and was instrumental in arranging for the first tournament to be held at the Parry Sound Golf and Country Club. Brock Tudhope later became a member of the planning committee and served 6 years as President of the local affiliate. Golf is more than a game to the partners, it’s a passion. Many of Lorne Tudhope Insurance’s partners have had the rare distinction of sinking numerous hole-in-ones, with Lorne sinking five, Bob with two, Brock with one and Ken Dobson coming awfully close a number of occasions. A team captained by Lorne Tudhope and including sons Brock and Robert along with John Campbell and Scott Cowx won the prestigious Bobby Orr Hall of Fame Celebrity Golf Classic in 2005 and 2006. It is rumoured that Bobby Orr has signed up for golf lessons from Lorne. Curling has also been an interest of the five partners. This translated to Lorne Tudhope Insurance becoming one of the first sponsors of the Georgian Ladies Curling Bonspiel and one of the early sponsors of the 30,000 Island Curling Bonspiel. In 1963 Lorne competed in the Ontario British Consols Playdowns and in 1983 Lorne and Brock had the rare distinction of scoring an 8 ender while competing on the 30,000 Island Bonspiel. If you are from Parry Sound, you know that Lorne Tudhope Insurance is highly recognized for its involvement in minor hockey. Members of Lorne Tudhope Insurance have acted as sponsors, executives and even coaches of many hockey teams in the Parry Sound area. So much so, in fact, that when entering the Bobby Orr Community Centre you will rarely see a picture, trophy or jersey that does not hold the Lorne Tudhope Insurance name. 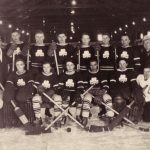 Lorne Tudhope Insurance has sponsored a number of midget and junior teams and even became the first and only sponsor of the first Parry Sound Juvenile hockey team, which was then coached by Bev Crawford. A local midget team, sponsored by Lorne Tudhope Insurance, received a government grant to travel to Mount Pearl, Newfoundland to compete. The grant could; however, only take them so far. This is where the five partners of Lorne Tudhope Insurance graciously stepped in to aid in the additional fundraising. Most notably, Ken Dobson stepped up to be a leader in this effort by organizing and supervising the trip. Brock Tudhope acted as the team’s assistant coach. In addition Lorne Tudhope Insurance was a proud sponsor of the Easter Seal Bobby Orr Skate-a-thons organized by the Rotary Club of Parry Sound. Their participation in all six Skate-a-thons along with Bobby Orr served as a caring example to the Easter Seal Children. Lorne Tudhope Insurance’s partner company, Lorne Tudhope Realty ran by Lorne, Bob, Ken Dobson and Ken Brown also contributed greatly to sports in Parry Sound by sponsoring the Parry Sound Figure Skating Club for several years, an organization in which Marleen Brown, Ken Brown’s wife, has been greatly involved. Lorne Tudhope Insurance have been leaders in supporting sports in Parry Sound since the company was founded; however their contributions to the health care industry in Parry Sound are also definitely worth noting. All partners, both together and separately, have been actively involved with a number of health care organizations both in Parry Sound and throughout Ontario. The partners have acted as board members, sat on committees, focused efforts on the building of new health care related facilities and have contributed greatly to the fundraising efforts of many of these organizations. In addition to contributing to sports and health care in Parry Sound, Lorne Tudhope Insurance and its five partners have been involved with many other community organizations. For example Ken Dobson has held a number of positions with the Rotary Club, the Chamber of Commerce, the West Parry Sound Hospice Association and the St. James Centennial United Church. Bob Drummond was a founding member of the Parry Sound Big Brothers Association, and has been involved with the Salvation Army Red Shield Appeal, the Chamber of Commerce and was a past president of both the Parry Sound Tennis Club and the Parry Sound Badminton Club. Ken Brown was a volunteer firefighter, and was involved with the Granite Masonic Lodge, the Wabuno Shrine Club, the Kinsmen Club and served as the town Mayor from 1976 to 1980. Lorne is a 60 year member of Canadian Legion and was recently” Veteran of the Month”. He has held a number of positions with the Granite Masonic Lodge, The Wabuno Shrine Club and the Parry Sound Lions Club. Brock currently acts as a volunteer for the Wabuno Shrine Club, is a member of the Parry Sound Lake Trout Advisory Committee is a Ducks Unlimited member and has sat on the Massasauga Parks Advisory Committee as the Chamber of Commerce representative. On October 10, 2002, Ken Brown passed away suddenly, leaving behind his loving family and friends. There are many people today that still miss his friendly presence. Ken is survived by his wife Marleen and their three children, Rick, Beth and Tricia. Ken’s legacy lives on through the annual Ken Brown Memorial Golf Tournament, hosted by the Wabuno Shrine Club. Lorne Tudhope Insurance, now Canada Brokerlink, along with the three of the four retired partners have been actively involved with this tournament. The tournaments funds are donated to two of Ken’s favourite causes, the West Parry Sound Health Centre and the Wabuno Shrine Club. 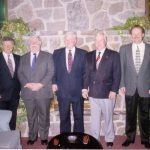 When Brock became president of the company in 1994, part of his personal mandate was to find a way for the senior partners to retire”, a mandate which he was able to achieve with the retirement of the four partners on September 30, 1995. The legacy of Lorne Tudhope Insurance lives on today through Brock Tudhope, and the dedicated staff at Canada Brokerlink, who have kept the values that the original company instilled by continuing to be involved in enriching the community of Parry Sound. Today, the retired partners relax by playing golf, most often at the Parry Sound Golf and Country Club. They also enjoy watching sports on TV, catching local games at the Bobby Orr Community Centre, spending time with family and friends and traveling. Brock Tudhope currently acts as Commercial Insurance Manager for Northern Ontario with Canada Brokerlink and spends his spare time golfing, cottaging and fishing. 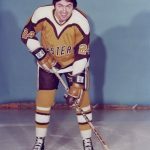 For the company’s, and its partners’, outstanding contributions to sports, health care and community activities in the Parry Sound area for over 40 years, Lorne Tudhope Insurance Brokers Ltd. is more than worthy of being the first Patron to be inducted in the Honorary Category of the Bobby Orr Hall of Fame. Lorne Tudhope Brokers Ltd., we salute you.